The real importance behind the learning of radiographic signs associated with specific diseases is of relevance to the clinical examination of the head and neck. Knowledge of such signs may quickly solve some difficult diagnostic problems and appropriate treatment instituted. The following list takes you through conditions met by the authors in their clinical practice and in examinations which could, therefore, be considered worth knowing and helpful in academic and clinical excellence. The periphery of the expanded cortex is more opaque than the region inside the expanded border. The cortical bone is not thicker on the cortex than over the rest of the lesion, but rather the X-ray beam is more attenuated in this region because of the longer path length of photons through the bony cortex on the periphery. Circular, fluid-filled shaped structure appears much like inflated balloon. 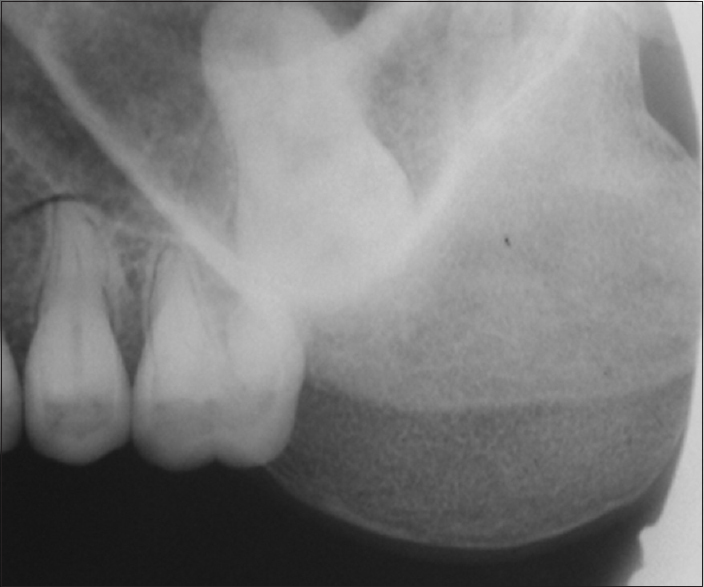 Most commonly seen in follicular cysts on occlusal radiographs  [Figure 1]. The growing brain exerts a pulsatile pressure on the malleable cranium, producing a gyral pattern/convoluted markings evidenced on plain skull X-rays known as copper-beaten skull appearance. 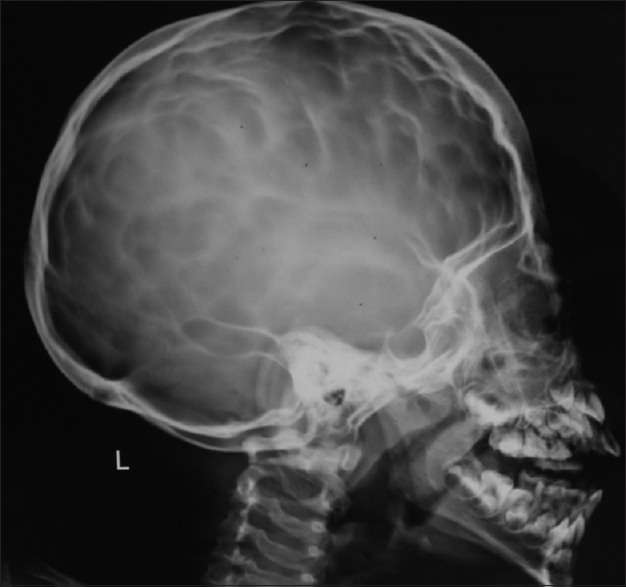 Evident in patients with Crouzon syndrome, hypophosphatasia, craniosynostosis, and obstructive hydrocephalus on the lateral skull and postero-anterior view. Currently, it is widely considered to be a reflection of normal brain growth, without pathological significance. The markings are most prominent during periods of rapid brain growth, between age 2-3 years and 5-7 years. They become less prominent after approximately 8 years of age  [Figure 2]. It's a triangular area of new subperiosteal bone that is created when a lesion, often a tumor, raises the periosteum away from the bone. A Codman triangle is not actually a full triangle. Instead, it is often a pseudotriangle on radiographic findings with ossification on the original bone and one additional side of the triangle which forms a two-sided triangle with one open side. This two-sided appearance is generated due to a tumor (or growth) that is growing at a rate which is faster than the periosteum can grow or expand, so instead of dimpling, the periosteum tears away, and provides ossification on the second edge of the triangle. Seen on occlusal radiographs in cases of alveolar bone carcinoma, osteogenic sarcoma, Ewing's sarcoma, etc.,  [Figure 3]. The lesions that invade to the inferior border of the mandible when their size reaches a limit that often demonstrates a characteristic downward bowing of the inferior cortex of the mandible. It has a centrifugal growth pattern rather than a linear one, revealing equal expansion in all directions as a round tumor mass. 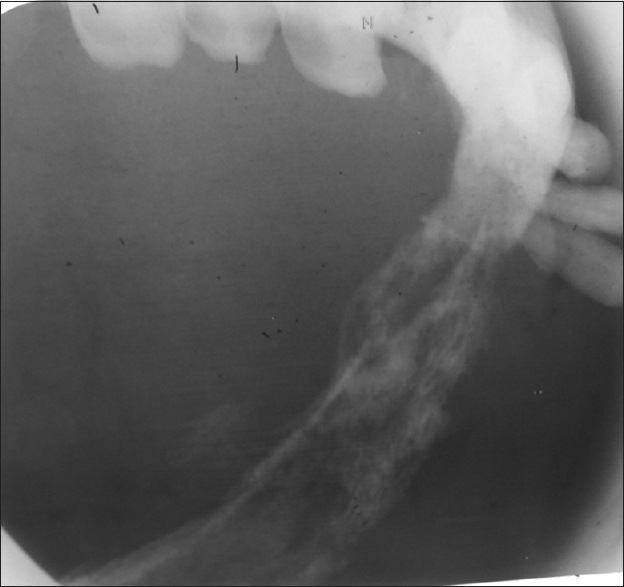 It's most commonly evident in cases of cemento-ossifying fibroma and ameloblastoma  [Figure 4]. It is a result of alveolar bone destruction around the root of the teeth giving the appearance of a floating tooth on the X-ray. Seen in cases of histiocytosis X, severe periodontitis, malignant lymphoma, and other malignant diseases , [Figure 5]. Ground glass is glass whose surface has been ground to produce a flat but rough (matte) finish. In radiology, it's a lucent lesion, with endosteal scalloping, with or without bone expansion, and the absence of periosteal reaction, usually the matrix of the lucency is smooth and relatively homogeneous; classically, this finding is described as a ground-glass appearance. Irregular areas of sclerosis may be present with or without calcification. The lucent lesion has a thick sclerotic border. Evident in cases of fibrous dysplasia, paget's disease, hyperpararthyroidism, and ossifying fibroma  [Figure 6]. In the cases of regional odontodysplasia, there is thinning of enamel and dentin layers, with wide pulp chambers. This gives a typical ghost teeth appearance, formed due to lack of contrast between enamel and dentin, both of which are less radiopaque than uneffected counterparts. 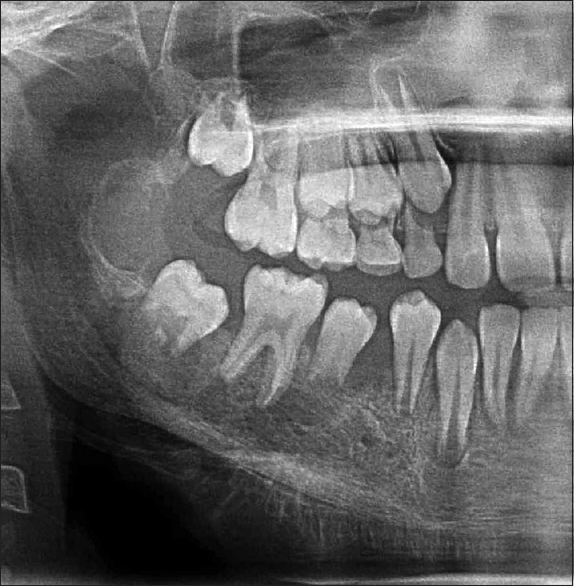 Teeth appear more radiolucent than normal  [Figure 7]. In the maxillary central incisor region, anterior nasal spine comes over cystic radiolucency giving it a typical heart shape, and it's a characteristic sign for nasopalatine cyst , [Figure 8]. 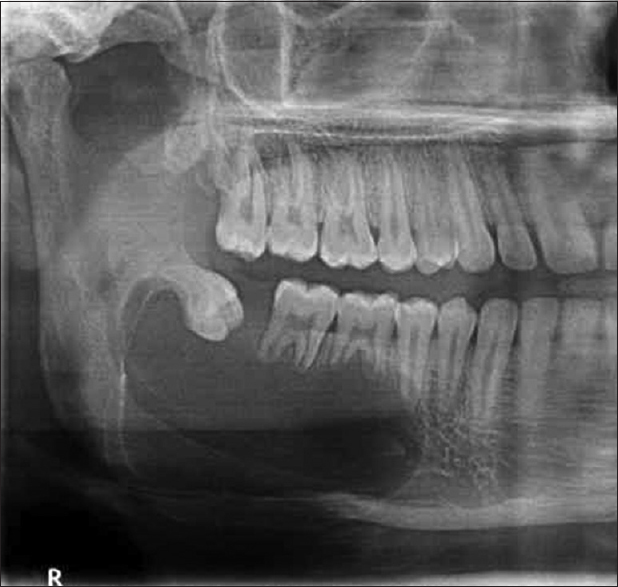 Multiple lytic lesions, that is, with the local disappearance of normal bone due to resorption giving a punched out pattern. Most commonly seen in cases of multiple myeloma and langerhans cell histiocytosis  [Figure 10]. Root less teeth: Teeth without the formation of complete roots and its characteristic feature of Type I dentin dysplasia  [Figure 11]. If the lesion grows rapidly but steadily, the periosteum will not have enough time to lay down thin shell of bone, and in such cases, the tiny fibers that connect the periosteum to the bone (Sharpey's fibers) become stretched out perpendicular to the bone. When these fibers ossify, they produce a pattern sometimes called "sunburst" periosteal reaction. Noticed in cases of osteosarcoma, hemangioma, and osteoblastoma  [Figure 12]. 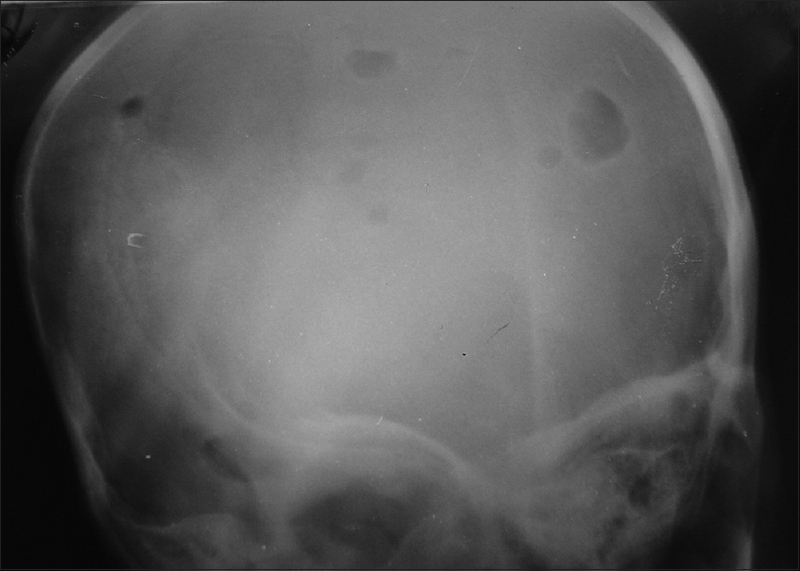 A radiographic appearance present in radiolucent multilocular lesions, consisting of circular compartments of varying size, and appear to somewhat overlap. Evident in cases of ameloblastoma, aneurysmal bone cyst, and central hemangioma  [Figure 13]. Some radiographic patterns are pathogonomic and characteristic to a specific disease and thus can be used for narrowing the differential diagnosis and thereby helping the new budding doctors for radiodiagnosis. White SC, Pharoah MJ. Imaging principles and techniques. Oral Radiology - Principles and Interpretation. 6 th ed., Ch. 4. Indian Reprint, 2011, ISBN: 978-81-312-1977-5: Projection Geometry Mosby Elsevier; 2011. p. 51-2. Vela Desai, Smita RP, Rajeev S. Copper Beaten Skull! Can it be a usual apperance? Int J Clin Pediatr Dent. 2014;7:47-9. 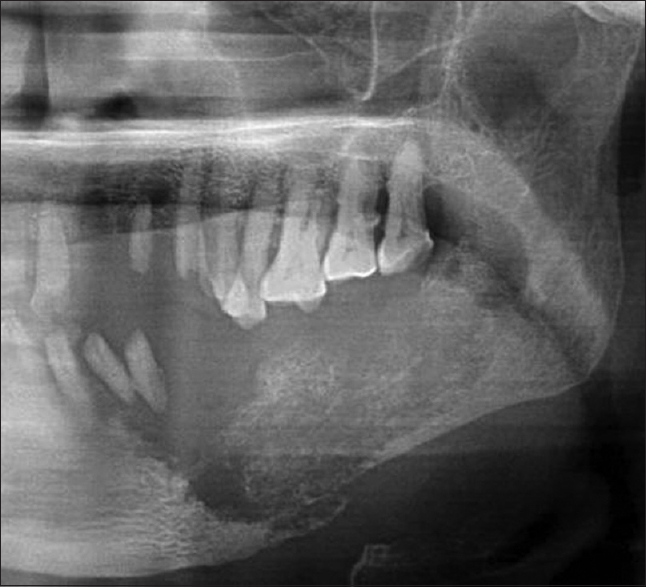 Anitha B, Winnifred C, Sumathy C, Kannan A. Osteosarcoma of mandible: A case report and review of literature. J Clin Diagn Res 2012;6 Suppl 2:753-7. Misra SR, Lenka S, Sahoo SR, Mishra S. Giant pindborg tumor (calcifying epithelial odontogenic tumor): An unusual case report with radiologic-pathologic correlation. J Clin Imaging Sci 2013;3 Suppl 1:11. 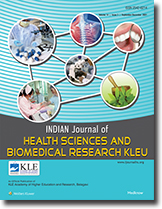 Neyaz Z, Gadodia A, Gamanagatti S, Mukhopadhyay S. Radiographical approach to jaw lesions. Singapore Med J 2008;49:165-76. Jayachandran S, Balaji N. Langerhans cell histiocytosis. World J Dent 2011;2:57-62. Lee BD, Lee W, Lee J, Son HJ. Eosinophilic granuloma in the anterior mandible mimicking radicular cyst. Imaging Sci Dent 2013;43:117-22. Collins J, Stern EJ. Ground-glass opacity at CT: The ABCs. AJR Am J Roentgenol 1997;169:355-67. Magalhães AC, Pessan JP, Cunha RF, Delbem AC. 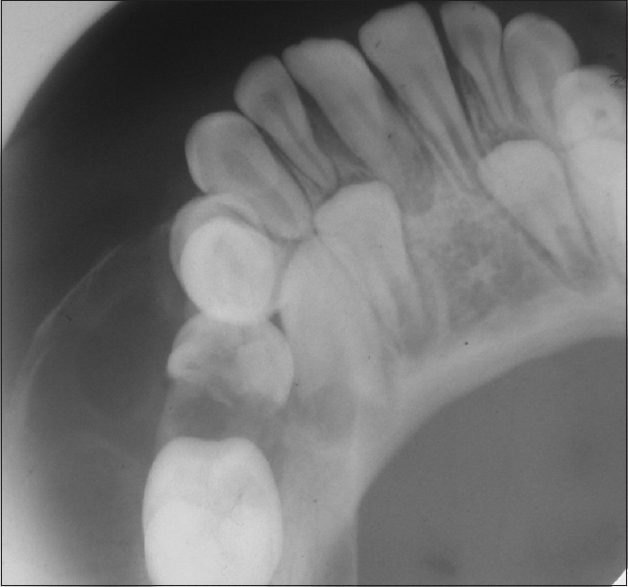 Regional odontodysplasia: Case report. J Appl Oral Sci 2007;15:465-9. Mittal A, Soheyl AS, Vinod VC, Garg P. Images: Central hemangioma of maxilla. Indian J Radiol Imaging 2007;17:163-5. Ghosh S, Wadhwa P, Kumar A, Pai K, Seshadri S, Manohar C. Abnormal radiological features in a multiple myeloma patient: A case report and radiological review of myelomas. Dentomaxillofac Radiol 2011;40:513-8. Escoda Francolí J, Almendros Marqués N, Berini Aytés L, Gay Escoda C. Nasopalatine duct cyst: Report of 22 cases and review of the literature. Med Oral Patol Oral Cir Bucal 2008;13:E438-43. Fating C, Gupta R, Lanjewar M, Nayak B, Bakshi A, Diwan R. Nasopalatine duct cyst: A rare case report. Chattisgarh J Health Sci 2013;1:103-6. Malik R, Misra D, Misra A. Asymptomatic, expansive, unilateral multilocular radiolucency with moth eaten appearance of body of mandible. Int J Dent Case Rep 2011;1:101-6. 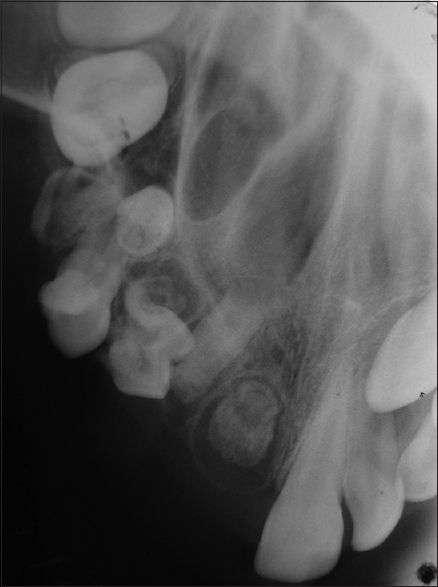 Araki M, Matsumoto K, Matsumoto N, Honda K, Ohki H, Komiyama K. Unusual radiographic appearance of ossifying fibroma in the left mandibular angle. Dentomaxillofac Radiol 2010;39:314-9. Wang CL, Yacobi R, Pharoah M, Thorner P. Ewing′s sarcoma: Metastatic tumor to the jaw. Oral Surg Oral Med Oral Pathol 1991;71:597-602. Fulari SG, Tambake DP. Rootless teeth: Dentin dysplasia type I. Contemp Clin Dent 2013;4:520-2. White SC, Pharoah MJ. Systemic diseases manifested in the jaws. Oral Radiology - Principles and Interpretation. 6 th ed., Ch. 25. philadelphia: Mosby Elsevier Publications; 2011. p. 468-9. 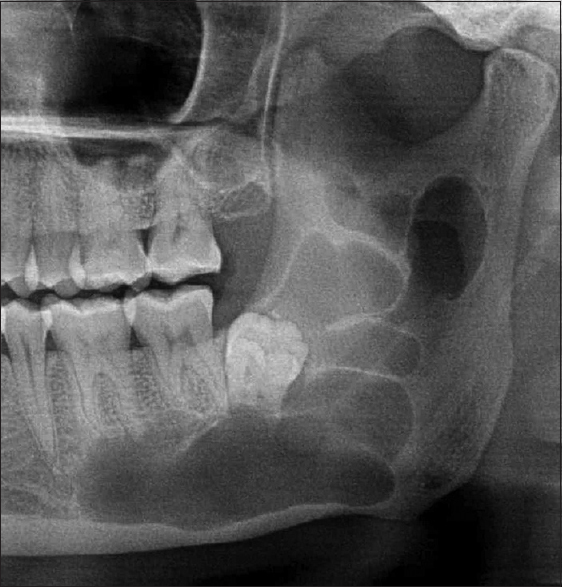 Mohammadi A, Ilkhanizadeh B, Ghasemi-Rad M. Mandibular plasmocytoma with sun-ray periosteal reaction: A unique presentation. Int J Surg Case Rep 2012;3:296-8. Fan X, Qiu W, Zhang Z, Mao Q. Comparative study of clinical manifestation, plain-film radiography, and computed tomographic scan in arteriovenous malformations of the jaws. Oral Surg Oral Med Oral Pathol Oral Radiol Endod 2002;94:503-9. Vijayalaxmi D, Murali S, Sekar B. Odontogenic myxoma - An unusual presentation. JIADS 2011;2:48-51.